UND undergraduate Tyson Berg is wrapping up a summer research experience working with an interdisciplinary team, combining his knowledge of chemistry and unmanned aerial systems. (pictured left to right) UND Chemistry Professor Alena Kubatova, Chemistry Graduate Student Brett Nespor, UND Chemistry/UAS Aviation Student Tyson Berg, UND UAS Lead Flight Instructor James Moe, Ales Kubat. Photo by Tyler Ingham. University of North Dakota senior Tyson Berg hails from the little town of Walnut Grove, Minn. If you’ve heard of community of fewer than 1,000 people, it might be because it’s the childhood home of Laura Ingalls Wilder, author of the popular “Little House on the Prairie” book series that illustrates America’s early pioneer days. But although Berg grew up around museums and parades that celebrate yesteryear, his eyes are locked on the future. Tyson is double majoring in Chemistry and Unmanned Aerial Systems (UAS) Aviation – a recipe for great research opportunities. This year, Berg has been working with UND Chemistry Professor Alena Kubatova and others across campus to research how UAS can be used to collect carbonaceous particulate matter at different atmospheric elevations. Certain carbon materials may affect cloud formations and precipitation patterns, so the team is hoping to gather enough preliminary data to support large funding proposals to the National Science Foundation (NSF), Environmental Protection Agency (EPA) and/or NASA. Berg’s dual know-how is a key part of this summer’s study. He earned his commercial UAS certificate in the fall, and that training, paired with the chemistry lab hours he’s already logged during his undergrad, gives him a one-of-a-kind perspective. “You want to be able to pre-program UAS paths and take the consideration of air flow through the device, and Tyson is really in a unique position to do that,” Kubatova said. After collecting the carbon data from the air this summer, Berg will spend the fall semester processing that data as a part of his senior Capstone course. Lab work won’t be new to him, but he knows that’s not the case for everyone. The departments of Chemistry and Aviation teamed up this year to study how carbon particles in the air can affect cloud formations and weather patterns. 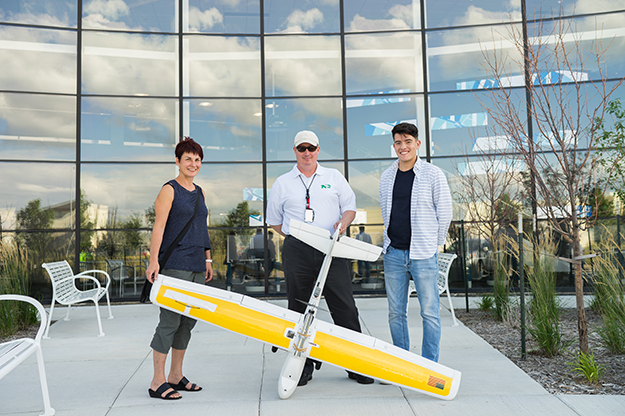 (pictured left to right) UND Chemistry Professor Alena Kubatova, UND UAS Lead Flight Instructor James Moe, UND Chemistry/UAS Aviation Student Tyson Berg. Photo by Tyler Ingham. Berg isn’t alone in urging undergraduates to get involved in research early. 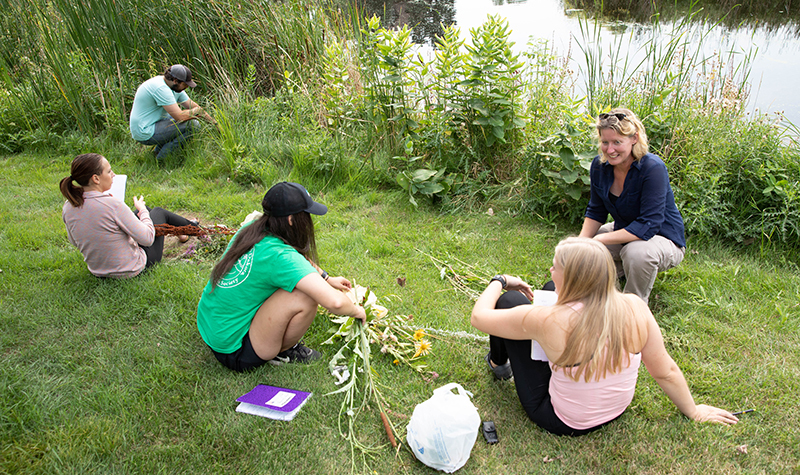 That’s been the goal of the Undergraduate Research/Creative Activity Initiative, funding offered through the College of Arts & Sciences for special projects like Berg and Kubatova’s. This initiative also supports Goal One of the One UND Strategic Plan, providing a strong liberal arts foundation through high-impact learning practices. “The experience is great, but to get paid for it helps me through. The relief of having something like this is just incredible. Especially with the aviation portion of school, it gets pretty expensive.” said Berg, who is also receiving research support this summer through the North Dakota Space Grant Consortium. 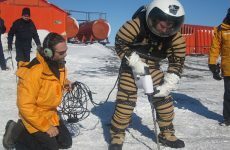 Atmospheric Sciences Research Associate Professor David Delene, who is another partner in the carbon-collecting project, said the experience Berg is gaining is integral to student success. “Involving undergrads in research provides examples of possible careers and illustrates practical applications of things discussed in classes,” he said. Kubatova is quick to express gratitude to all of the graduate students and cross-campus partners who have come together to make this research work. Along with atmospheric data collection knowledge from Delene, many others have offered help in getting the team airborne. UAS Lead Flight Instructor James Moe’s abilities have been essential – flying his own equipment and figuring out how to install the sampler on the drone. This kind of intensive collaboration, Kubatova says, is unique to UND. And as UND pushes toward becoming a more robust research institution (as articulated in Strategic Plan Goal Four), leveraging the strengths of multiple programs will continue to become more vital.